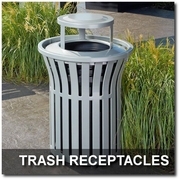 This UrbanScape Style "K" 32 Gallon Aluminum Slat Trash Receptacle with Bonnet Lid offers an elegant, upscale appearance. 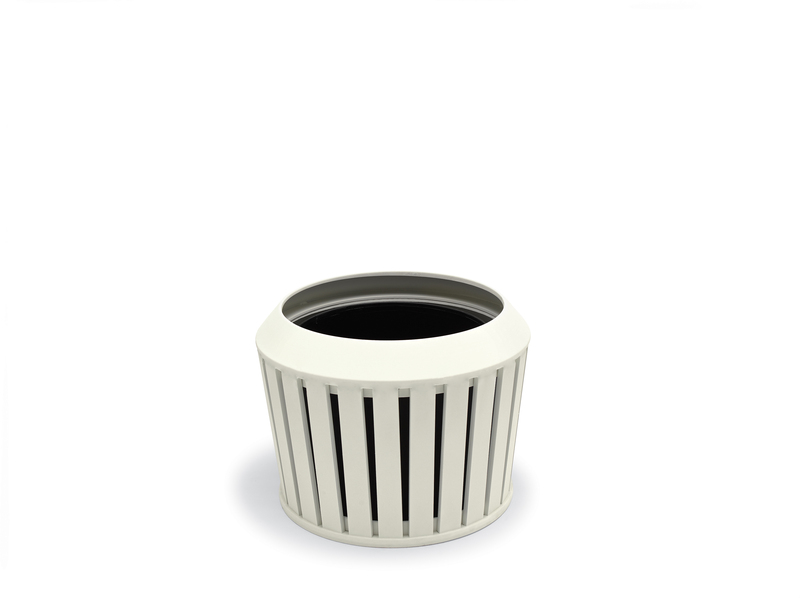 Constructed from solid aluminum slats that will not rust or corrode, this receptacle can withstand outdoor weather elements with ease. Choose from (14) distinctive powder coat finishes to coordinate with surrounding decors. Includes inner plastic liner. 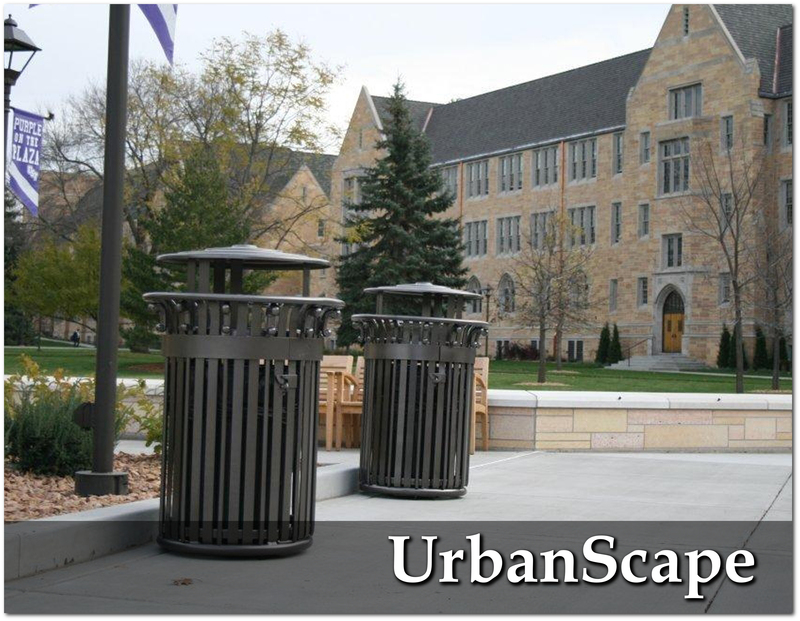 This UrbanScape Style "K" 32 Gallon Aluminum Slat Trash Receptacle with Ash Bonnet Lid offers an elegant, upscale appearance. 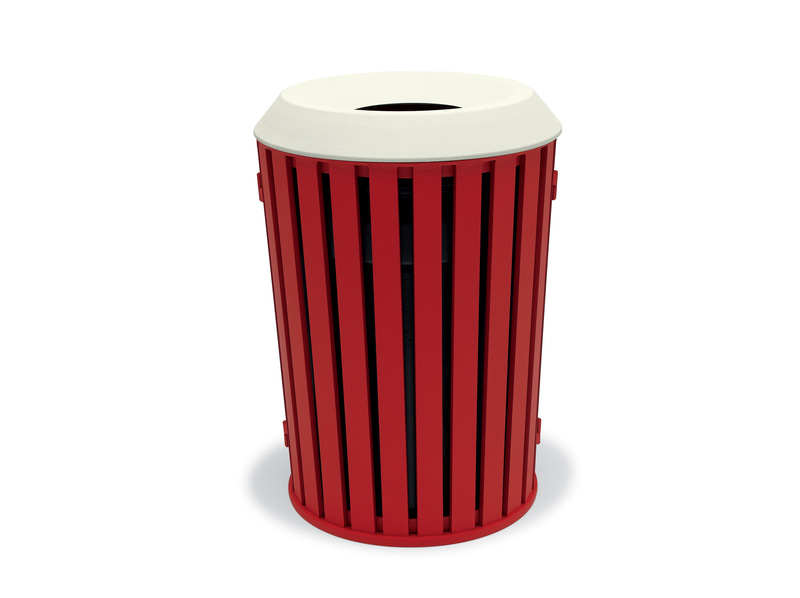 Constructed from solid aluminum slats that will not rust or corrode, this receptacle can withstand outdoor weather elements with ease. Choose from (14) distinctive powder coat finishes to coordinate with surrounding decors. 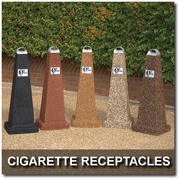 Ash Bonnet Top provides safe cigarette disposal. Includes inner plastic liner. 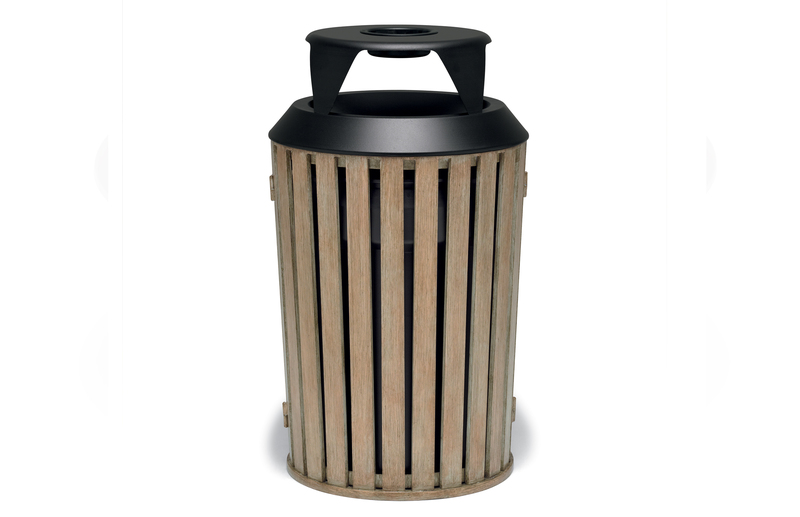 This Woodridge Collection 32 Gallon Trash Receptacle with Ash Bonnet Top features a sophisticated, modern appearance that compliments today's contemporary settings. Convenient side door allows access to inner plastic liner. Constructed from reinforced aluminum extrusion with a cast aluminum frame, this quality receptacle will not rust or corrode. 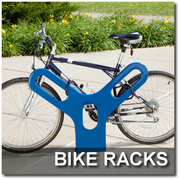 Choose from (14) distinctive powder coat finishes & (4) natural Faux-Wood colors to create a unique color combination. This Woodridge Collection 32 Gallon Trash Receptacle with Bonnet Top features a sophisticated, modern appearance that compliments today's contemporary settings. Convenient side door allows access to inner plastic liner. Constructed from reinforced aluminum extrusion with a cast aluminum frame, this quality receptacle will not rust or corrode. Choose from (14) distinctive powder coat finishes & (4) natural Faux-Wood colors to create a unique color combination. 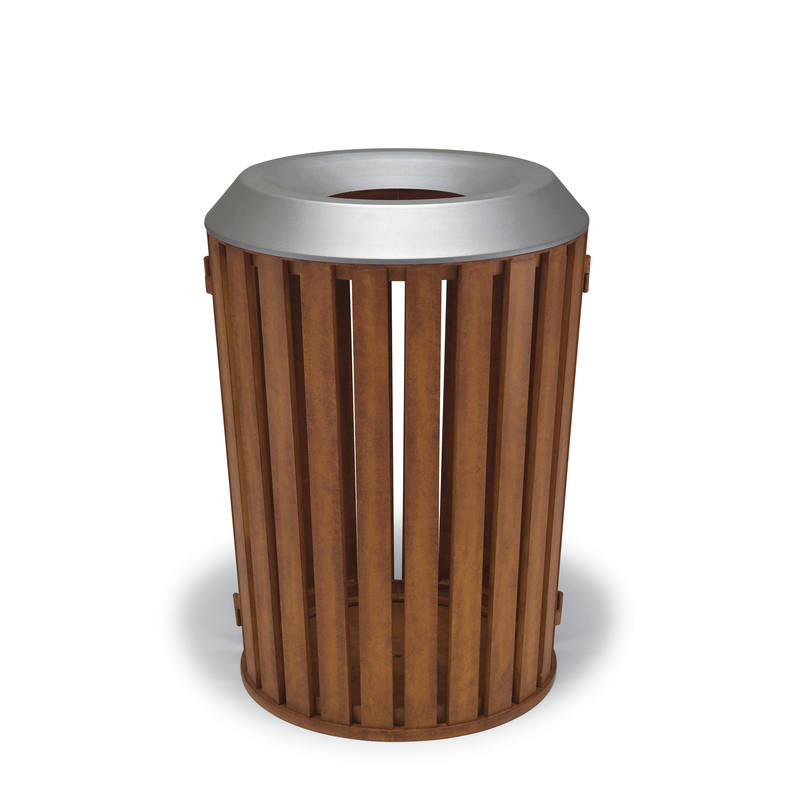 This Woodridge Collection 32 Gallon Trash Receptacle with Flat Top Lid features a sophisticated, modern appearance that compliments today's contemporary settings. Convenient side door allows access to inner plastic liner. 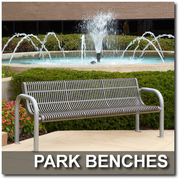 Constructed from reinforced aluminum extrusion with a cast aluminum frame, this quality receptacle will not rust or corrode. 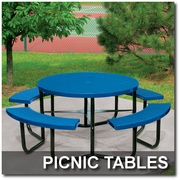 Choose from (14) distinctive powder coat finishes & (4) natural Faux-Wood colors to create a unique color combination. 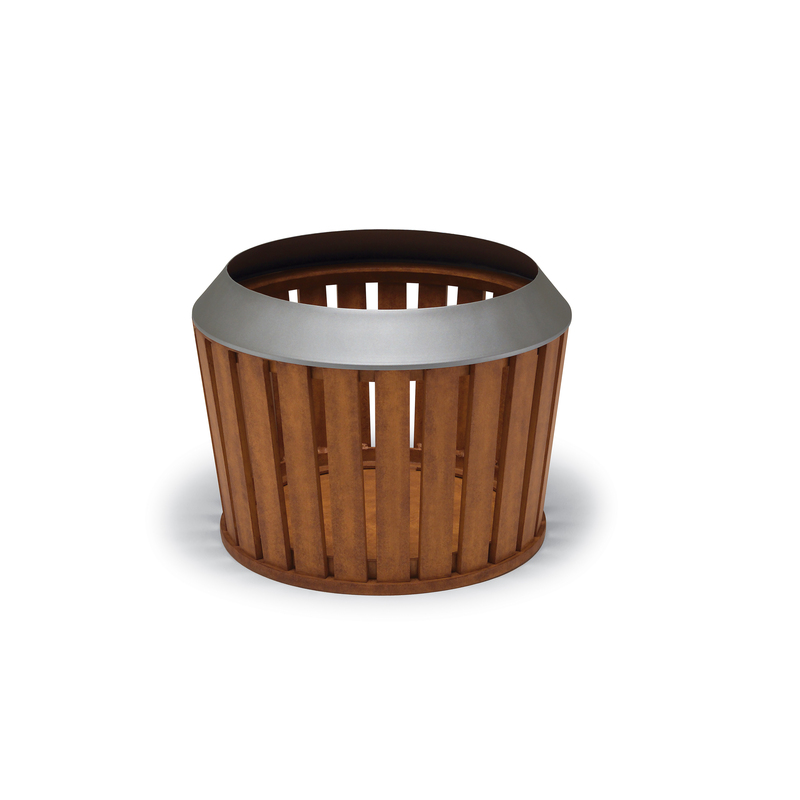 This Woodridge Collection Planter with Faux-Wood Finish features a sophisticated, modern appearance that compliments today's contemporary settings. Includes inner plastic liner. 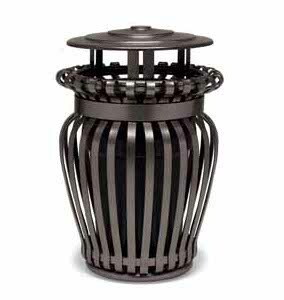 Constructed from reinforced aluminum extrusion with a cast aluminum frame, this quality receptacle will not rust or corrode. Choose from (14) distinctive powder coat finishes & (4) natural Faux-Wood colors to create a unique color combination. 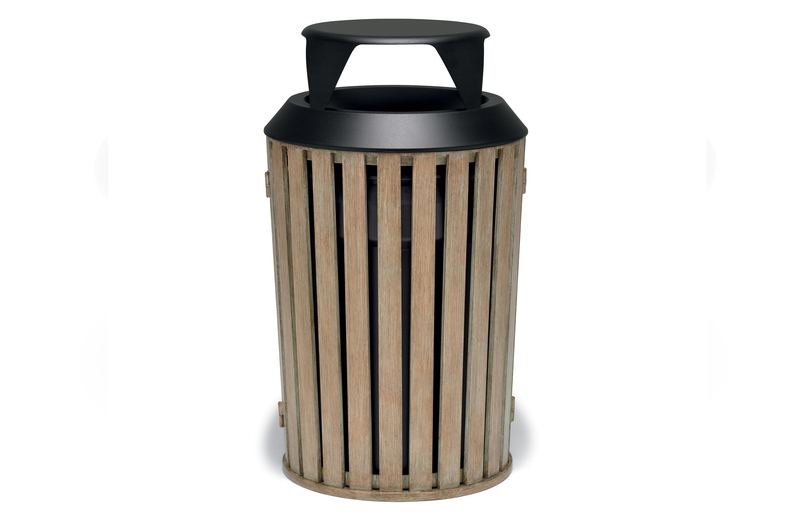 This Woodridge Collection 32 Gallon Trash Receptacle with Bonnet Top features a sophisticated, modern appearance that compliments today's contemporary settings. Convenient side door allows access to inner plastic liner. Constructed from reinforced aluminum extrusion with a cast aluminum frame, this quality receptacle will not rust or corrode. Choose from (14) distinctive powder coat finishes to create a unique color combination. 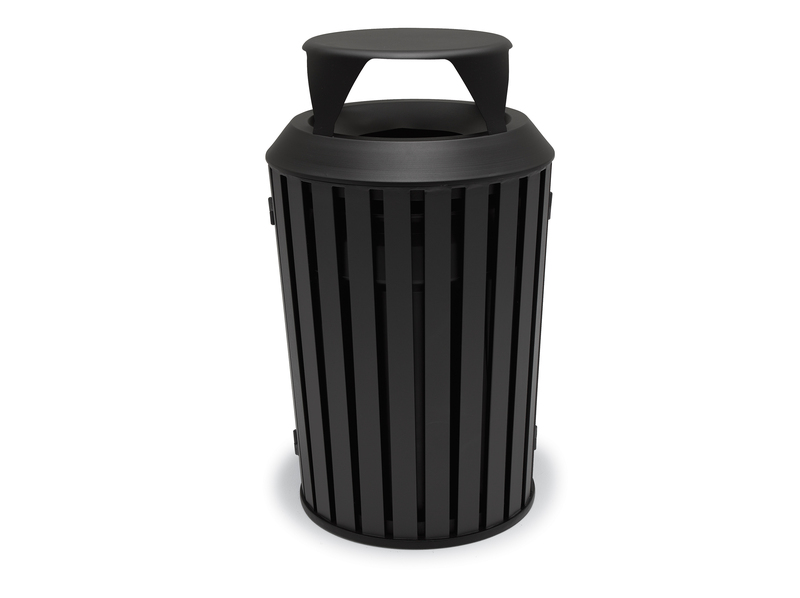 This Woodridge Collection 32 Gallon Trash Receptacle with Flat Top Lid features a sophisticated, modern appearance that compliments today's contemporary settings. Convenient side door allows access to inner plastic liner. Constructed from reinforced aluminum extrusion with a cast aluminum frame, this quality receptacle will not rust or corrode. 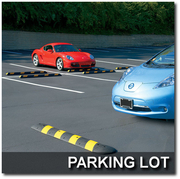 Choose from (14) distinctive powder coat finishes to create a unique color combination. 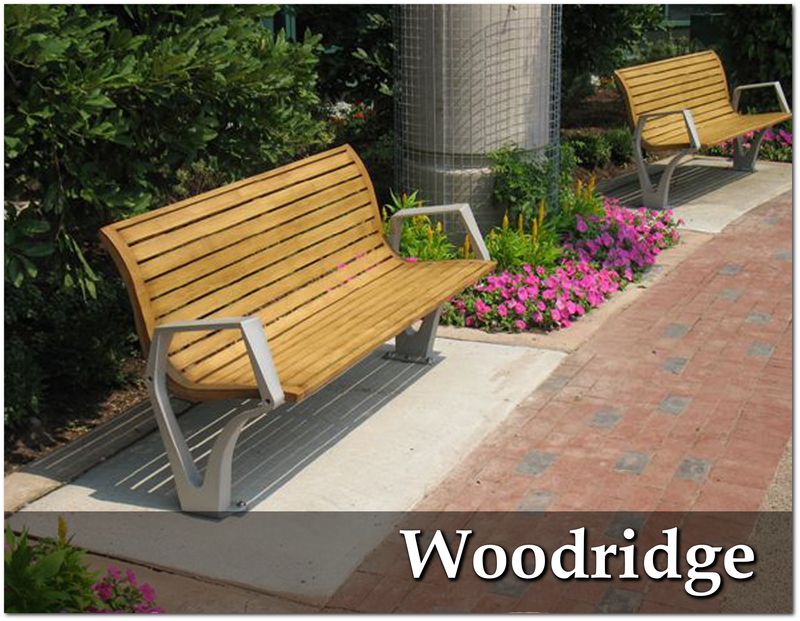 This Woodridge Collection Planter with Powder Coat Finish features a sophisticated, modern appearance that compliments today's contemporary settings. Includes inner plastic liner. Constructed from reinforced aluminum extrusion with a cast aluminum frame, this quality receptacle will not rust or corrode. 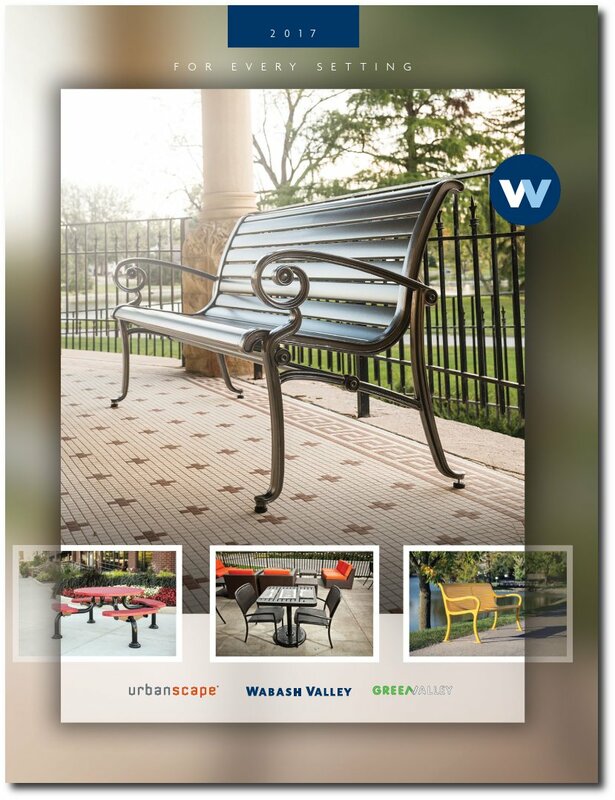 Choose from (14) distinctive powder coat finishes to create a unique color combination that will compliment your outdoor settings. 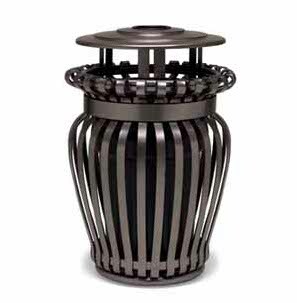 This UrbanScape Style "E" Round Perforated Steel Ash Urn is the perfect addition for any upscale, modern outdoor setting. 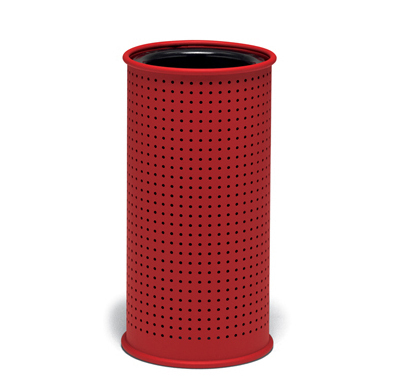 Constructed from heavy 12-gauge perforated steel that is protected with a state-of-the-art powder coat finish, this cigarette receptacle can withstand outdoor elements with ease. Choose from (14) distinctive powder coat finishes to coordinate with surrounding decors.